Vietnam’s Fisheries Society strongly objects on China’s violation in Vietnamese waters and attacks on Vietnam’s fishing boats. 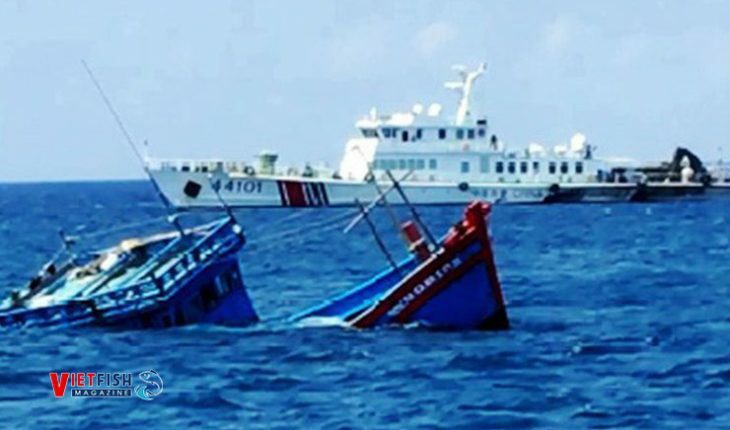 According to a report by Quảng Ngãi Fisheries Society and information from Fisheries Trade Union and Bình Châu Fisheries Sub-Society of Bình Sơn district, at 10 AM on March 06, 2019, the fishing boat numbered QNg 90819 TS led by Trần Minh Hùng (in Bình Châu commune, Bình Sơn district, Quảng Ngãi province) and five fishermen was attacked by a China’s vessel numbered 44101 while going fishing at coordinate 16015’N – 11038’E, about 5 miles away from Đá Lồi island of Parace Islands on the North West. Vietnamese fishing boat was pursued, sprayed water cannons, and made to crash into a reef, resulting the sinking. After hours of hanging on the floating prow, five fishermen were rescued by another Quảng Ngãi’s boat. They came home safely on March 17. The damage was estimated to be around three billion dong. Vietnam Fisheries Society condemned China and objected those inhumane activities that caused high risks to Vietnamese fishermen’s lives and damages to asset while they are exploiting marine species in the water of Vietnam’s Parace Islands. Vietnam Fisheries Society proposes Vietnam’s authorities to request China’s vessels to stop their activities of preventing, attacking and sinking Vietnam’s fishing boats in Vietnam’s water and give measures to fight against those inhumane activities. China is requested to compensate Vietnamese fishermen. The patrol forces and securities must be enhanced to protect and support fishermen for their safety assurance. Authorities need to work together to prevent these activities so that fishermen do not have to worry about their livelihoods.